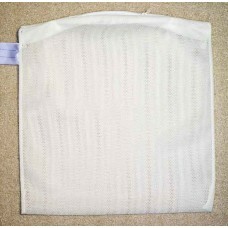 Bra bags are a close weave mesh bag which helps protect both bras and other lingerie in the wash from being tangled. We manufacture a wide range of mesh and net lingerie bags and have selected this bag as the one most suitable for washing girls bras. This bag is suitable for other delicate items you wish to wash in the bag, however if you require a different size bag, please see the main menu for our wide range of net and mesh bags. These bra bags are stocked in volume in the UK and are suitable for commercial users. They feature an identification label onto which you can write the name of the owner of the bra or which room the bag belongs to. The bra bag has a non-scratch polyester zip to provide secure closure of the bag. Made from 100% strong and durable polyester mesh. 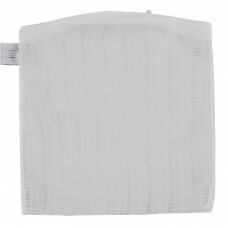 Zipped Mesh Bra Bag 13" x 13"
Close strong weave to minimise the possibility of the hooks on bras from snagging other items in the..
Zipped Mesh Bag: Medium 17" x 17"
Zipped mesh bag slightly larger than the standard bra bag. Used for 5-6 pairs of socks or other ligh..